Promoting Student Learning: these features were created to motivate students to think about the material presented, ask interesting questions, and develop good problem-solving skills. New Caution margin boxes appear at appropriate places to help students avoid common mistakes. Recall margin boxes direct students back to previous presentations in the text to review definitions and formulas, and to reinforce key concepts in context. Did You Know margin boxes provide information that helps with the contextual understanding of the statistical questions. Annotated figures feature labels to identify noteworthy aspects in each illustration that may not be obvious to inexperienced students; many captions include questions designed to challenge students to think more about the information being presented. Active learning is encouraged through the use of simulations and hands-on activities via Learning Catalytics. Learning Catalytics is a web-based engagement and assessment tool. As a "bring-your-own-device" direct response system, Learning Catalytics offers a diverse library of dynamic question types that allow students to interact with and think critically about statistical concepts. As a real-time resource, instructors can take advantage of critical teaching moments both in the classroom or through assignable and gradable homework. Chapter-opening examples include a high-interest example that raises questions and establishes a chapter theme. Opening examples use real-world data from a variety of applications. 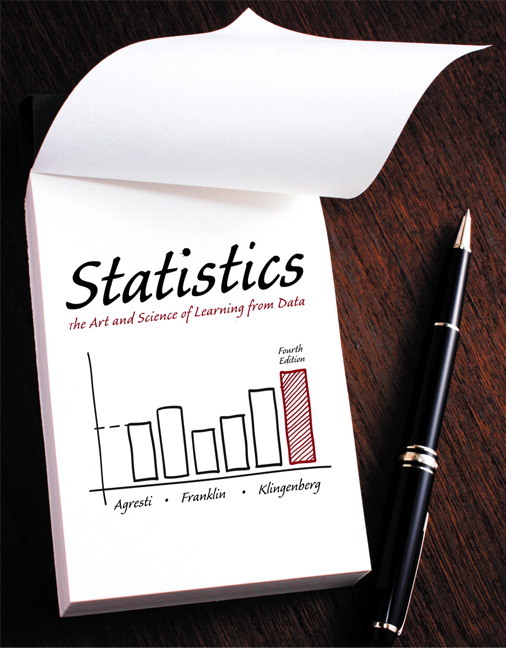 In Practice boxes alert students to the way statisticians actually analyze data in the real world. Exercises and Examples incorporate real data and focus on intriguing topics that appeal to students. 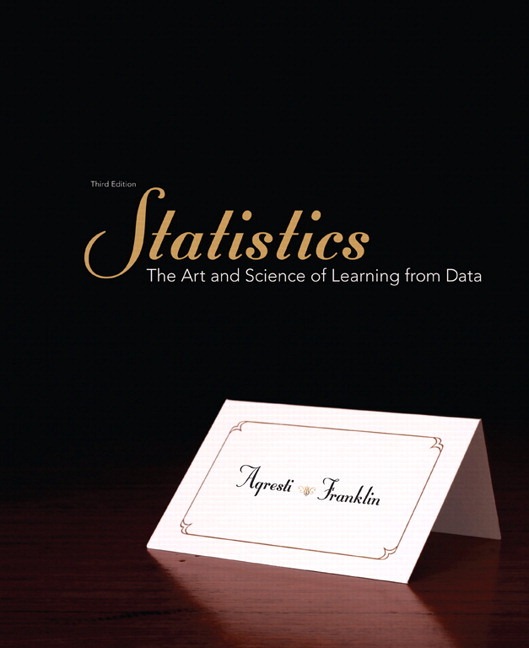 Examples emphasize thinking about and understanding statistics through analysis of current real data. 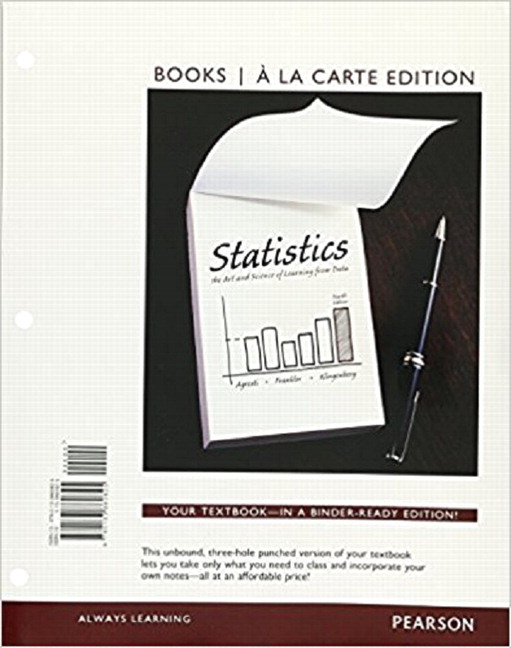 The unique five-step format encourages students to model the thought processes required to examine issues in statistics. Picture the Scenario presents background information so that students can understand the context of the data. Questions to Explore show students the appropriate questions to ask about the scenario and focus on what students should learn from the example. Think It Through is the heart of each example, as the Questions to Explore are investigated and answered using the appropriate statistical methods. Insight clarifies the central ideas investigated in the example and places them in a broader context that states the conclusions in less technical terms. This step also connects concepts from other sections in the book. A Try Exercise directs students to an end-of-section exercise that allows immediate practice of the concept. Concept tags are included with each example so that students can easily identify the concept demonstrated in the example. NEW and updated example videos are available in MyStatLab for students to watch as they work through in-text examples. A plethora of chapter exercises test student comprehension through interesting real-data problems. Exercises, divided into three categories, address relevant and thought-provoking topics, such as cell phone usage, cancer, and public support for the death penalty. Practicing the Basics reinforce basic applications of methods. Concepts and Investigations require students to explore the theory and concepts presented in the chapter through real data sets. Student Activities are appropriate for individual or group work and often make use of the web apps that accompany the text. “Part” organization divides the book into four Parts. Each Part has a corresponding Part Review in MyStatLab to help students understand the “big picture” and solve exercises that review the key concepts, ideas, and techniques. Included are Summary Questions, Summary Examples, and Part Exercises. Modern technological techniques are used to develop concepts and analyze data. Output from computer software (Minitab®, StatCrunch, Microsoft Excel®) and the TI-83/84 Plus graphing calculator is used to illustrate many concepts. Activities and Web Apps referred to in the text are found within MyStatLab or at the Companion Website (www.pearsonhighered.com/AFK). The use of web apps offers a way to show students certain concepts visually. Chapter-specific Instructor Notes appear in the Annotated Instructor’s Edition. These time-saving notes give insights into the authors’ approach to the material, suggestions for additional classroom examples and activities, learning objectives, and other helpful teaching tips. UPDATED! Instructor-to-Instructor videos feature the authors’ perspectives on chapters and helpful suggestions for how to teach from the book. The videos can be accessed through a link in Pearson’s Instructor Resource Center and through MyStatLab. NEW! Web Apps—delivered through examples, exercises, and simulations—allow students to interact with key statistical concepts and techniques, including permutation tests, bootstrapping, and sampling distributions. Students can explore the consequences of changing parameters and carry out statistical inference. Increased exercise coverage on 60% of the book's exercises, gives instructors even more options when creating assignments. Web Apps—delivered through examples, exercises, and simulations—allow students to interact with key statistical concepts and techniques, including permutation tests, bootstrapping, and sampling distributions. Students can explore the consequences of changing parameters and carry out statistical inference.